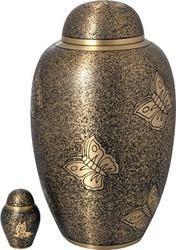 Manufacturer and exporter of Cremation Urns made of brass, aluminium and other materials. We can provide you top notch quality at most competitive prices and timely delivery. We can also custom develop the products as per your specification and designs. Just a few of our designs are displayed here, for a full range of Cremation urns, just drop us an email. 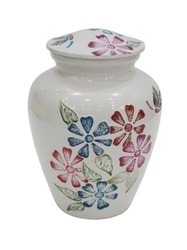 We are offering Adult Cremation Urn to our clients. Owing to our vast experience in this domain, we have been able to offer world-class Hand Engraved Brass Urns to our clients' end. Owing to our vast experience in this domain, we have been able to offer world-class Casted Brass Urns to our clients' end. These high-quality urns are demanded among the clients for their user-friendly features like lightweight, exclusive design and fine finishing. 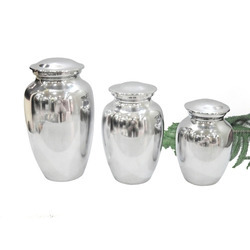 These are quality tested urns and used to carry human remains for holy reasons. Before the final dispatch, our quality controllers assure the quality of each and every urn by several stages of quality checks. We are offering Painted Funeral Urn to our clients. Owing to our vast experience in this domain, we have been able to offer world-class Flower Adult Urns to our clients' end. These high-quality urns are demanded among the clients for their user-friendly features like lightweight, exclusive design and fine finishing. These are quality tested urns and used to carry human remains for holy reasons. Before the final dispatch, our quality controllers assure the quality of each and every urn by several stages of quality checks. Owing to our vast experience in this domain, we have been able to offer world-class Aluminum Funeral Urn to our clients' end. Our organization is engaged in offering superior quality Metal Sheet Funeral Urn to our prestigious customers. 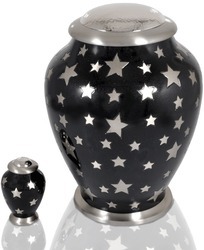 Owing to our vast experience in this domain, we have been able to offer world-class Stars Funeral Urns to our clients' end. 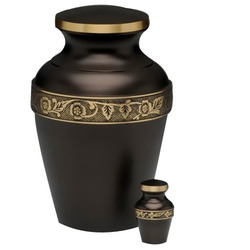 We are instrumental in offering high quality Black Nickel Funeral Urn in multiple eye-catching designs. 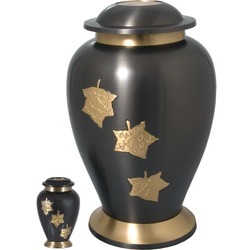 Offered urns are manufactured under the supervision of expert team, using fine quality raw nickels. 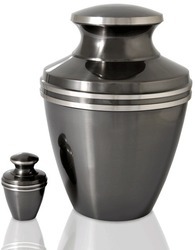 The urns, we offer are available at most competitive market price and used to transport human remains. 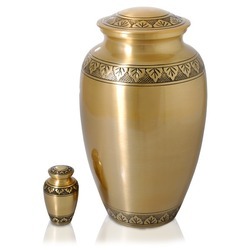 Our organization is regarded as one of the leading manufacturers and exporters of premium quality Brushed Brass Funeral Urns. Sourced from trustworthy vendors, quality assured brass metals are used in the manufacturing of these urns. Our professionals incorporate latest technology and designs in these funeral urns. Offered urns are used to transport human remains for any holy reason. 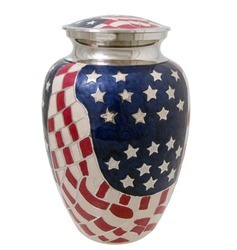 Aided by state-of-the-art infrastructure and dedicated workforce, we are able to manufacture and export highly demanded American Flag Funeral Urns at nominal market prices. 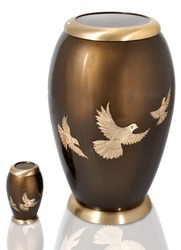 Excellent rigid design criteria combined with skilled workmanship automatically ensures superior quality urns. 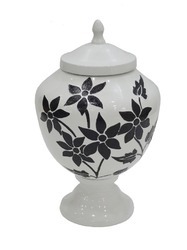 Offered urns are known for their classy look, smooth finishing and economic price. Owing to our vast experience in this domain, we have been able to offer world class Hand Embossed Cremation Urns to our clients end. 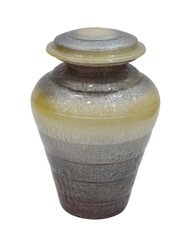 These high quality urns are demanded among the clients for their user friendly features like light weight, exclusive design and fine finishing. 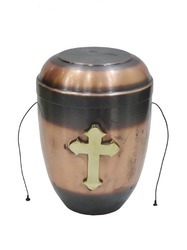 These are quality tested urns and used to carry human remains for holy reasons. Before the final dispatch our quality controllers assure the quality of each and every urn by several stages of quality checks.